Tracking the sales process is vital for every company, and that is where a CRM comes into play. Before we explain how can you move deals through stages on a specific pipeline, let’s briefly explain what a deal is and the steps to create one in Flexie CRM. A deal is an opportunity you’ve managed through your interaction with a specific lead or contact. Upon creating the deal, you can easily track as it moves through the sales pipeline. A pipeline is an accurate visual representation of opportunities(deals) and where do they stand in the sales process. To create a deal in Flexie CRM, navigate to Deals and on the drop-down menu click Deals. 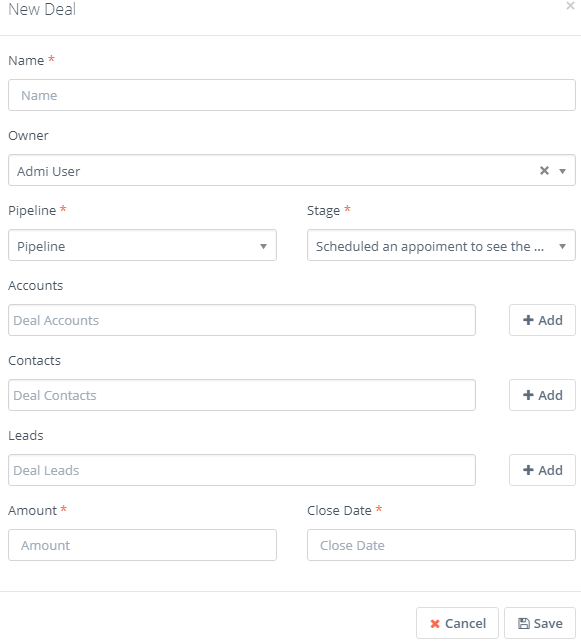 In the form you see below, set the owner of the deal, select the Pipeline and the stage (both required)and then you can also add an account, leads or contacts to that deal. Set an amount for the deal and a closing date, which are both required.Once you correctly fill in the fields, go to the bottom-right corner of the form and click Save. You’ve just created a new deal. Say you’re in the business of selling bikes and you’ve created the deal called Bike Sale. Next, you want to set the stages the deal will move through. How do you do that? 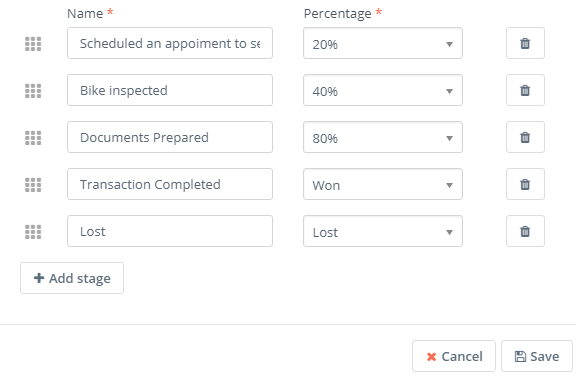 Flexie CRM let’s you set your own stages, so that they match your sales cycles process and business philosophy. In order to create your own stages, first go to Pipelines on the main menu. 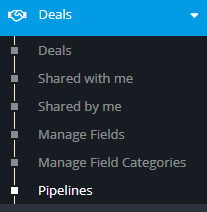 Once you click on it, you can see the name of the pipeline, how many deals does it contain, when it was last modified and the ID. Here you will also see the button called Manage Stages. Stages have a name and a percentage attached to it. You set a success percentage to each stage so that you have a clear idea of where you stand, and what needs to be done to close that specific deal. Notice that each deal, at the end of the process, is either won or lost. Furthermore, you can order stages as you want them to appear under your pipeline grid. Once you have set the stages, click Save. In our case, the Bike sale deal has all the stages we’ve just created. Moving the deal through stages is easy and quite intuitive. You can either click and bring the deal to the stage you want, or you can simply drag & drop from the pipeline grid. Say the potential custome has already inspected the bike. You can easily move from the initial stage to the bike inspection stage.After some back-and-forth and negotiations, the potential customer agrees and documentation is the next step. Once the required documents have been prepared, you can move the deal to the next stage, to Documents Prepared(80%). Next, the potential customer completes the transaction. You move the deal to the other stage, Transaction Completed(90 %). If everything goes as predicted, you move the deal to Won. If the deal falls through, you move it to Lost. Notice that each deal has a closing date. If a deal is not closed within a specified time frame, that deal is called overdue. You can also create custom reports to predict the accumulated value of your deals, hence the expected revenue for your company.